When you are using and iPhone and the Spell check option is On it will be a very difficult task to type any words in your native language other than English, and sometimes even the English words get changed all by themselves which is very annoying at times when you are in an official chat with a client or so. It gets frustrating when you are writing something important and you suddenly Delete it cut it or paste it when it is not required to. So if you want to learn tricks to undo the mistakes which your iPhone performs like typing, deleting, cutting, or pasting it is a simple trick which will help you correct these mistakes. When you have done a mistake in typing, deleted something by mistake, cut something, copied something or Pasted it in the wrong place you have to follow this simple procedure to undo all the mistakes you have done. 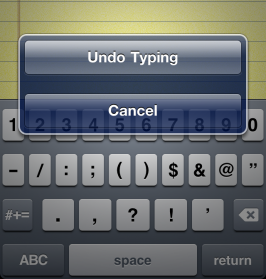 By selecting the Undo option you will be making sure that the mistakes you have performed can be undone and you can get back to your original position. This is a very simple trick which can be used in any instance while working in your iPhone, iTouch or iPad which will get you the above mentioned options. But make a note that you can only undo the mistakes which you have done recently and not the one’s done a while ago.